Normally each of us inherits 23 pairs of ‘homologous’ chromosomes (twin pairs with the same basic structure) one set from our father and one set from our mother, making 46 chromosomes in total. Each pair is numbered from 1 to 22 according to size. Number 23 is the pair that defines gender, containing either an X and a Y chromosome in men, or two X chromosomes in women. All 23 pairs are found in the nucleus or ‘engine’ of all blood cells apart from red cells. Each chromosome has a constriction point (centromere) dividing it into two sections or ‘arms’. The short arm is labelled the ‘p’ arm (for petite); q (chosen as the next letter after p in the alphabet) indicates the long arm. The location of the centromere gives each chromosome its characteristic shape and helps describe where specific genes are located. Changes to the basic structure of chromosomes can sometimes occur, possibly through exposure to ionizing radiation, environmental toxins or for other unknown reasons. A ‘Genome’ describes a complete set of DNA code; the human genome has been estimated to contain approximately 30,000 genes. Chromosomes are not visible in the nucleus unless the cell is in its dividing phase. They are actually long strands of DNA which, during the process of cell division become tightly packed; only then are they visible under a microscope. Most of what we know about chromosomes was learned by researchers observing cells during the dividing cycle. 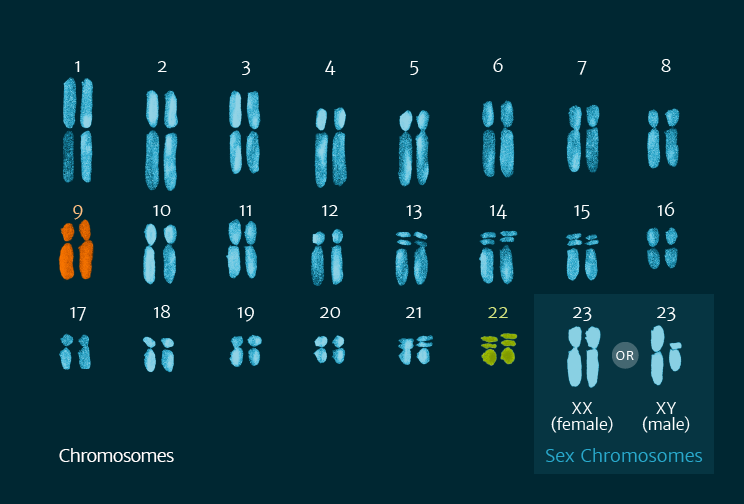 If you would like to study this subject further there is a very clear explanation of chromosomes and what they are on the 'Pass My Exams' website.